Today we have an interview with Christine Gent, MCSD, MA , a Fair Trade expert who has worked with farmers, producers, and artisan groups all over the world. She serves as an advisor to People Tree. Christine is currently the Director of Fairly Covered and has just completed working for Swiss company Pakka on the Geo Fair Trade project. Previously she was Ethical Trade Development Manager at The Body Shop, and has worked for WFTO, UNDP , UNESCO, and IRIS the European Network for Sustainable Businesses. People Tree: Why do you work for People Tree? Christine: I want my work to make a difference. Sometimes this means working with big corporations helping them to clean up their act. Other times it’s about working with organisations that are examples of good practise, such as People Tree. Why do you believe Fair Trade textiles and clothing are so important? Textiles are one of the world’s first traded commodities. They can be an exchange with international communities or an expression of one’s own nationality. I love clothes. I believe in a more equitable world, but that does not mean being boring where everyone is dressed the same. Clothing is important as it is a primary way in which we express ourselves. At the same time the clothing industry is urgently in need of reform in all areas. What did you do on the RAGS project? The RAGS project aimed to look at ways in which the UK garment industry could improve its performance. In the project, People Tree was evaluated against the ‘World Fair Trade Organisation Fair Trade Guarantee System.’ This is a new system for recognising businesses that are dedicated to being 100% Fair Trade throughout their supply chain. While People Tree had many things already in place as Fair Trade is a part of the People Tree DNA, the RAGS project made these practices slightly more systematic and formalised. People Tree, along with Fair Trade hat brand Pachacuti, are the first two businesses’ to be recognised as part of this new Fair Trade Guarantee System. I was very satisfied by this! The new system is about making it more possible to recognise every producer who works in the Fair Trade supply chain. In the past, the poorest, most marginalised producers often lacked the capacity to become certified Fair Trade. The new system makes it easier for groups like the one pictured above that are just starting to work with Fair Trade to participate. As a process to understand the Fair Trade principles and to identify areas for improvement the producers themselves score the groups performance against the principles. Watch the video to explain this here. What benefit did you see to the system? The reality with any new system is that it is more work at first. In order to become certified through the Fair Trade Guarantee System, Fair Trade producers may need to put new practices into place. Over time, the system will reduce workloads for producers. With the launch of the new WFTO Fair Trade Guarantee System mark on products, customers will be able to recognise and trust products made by organisations that are dedicated to Fair Trade. We hope one benefit of this for Fair Trade producers and brands will be growing demand for their products. Not everything can be Fair Trade. At the the moment, Fair Trade means buying from marginalised or disadvantaged communities in the developing world. But I think almost every individual, company and even govrenment buys some things – and we can all make a difference by buying Fair Trade. Why do you feel the People Tree approach is so unique? Do you enjoy working for a company that puts people, the environment and strategy central to everything it does? I have worked in Fair Trade for over 20 years. When I visited producer groups in the South, I noticed that if there had been a positive change, it had often been initiated by People Tree. People Tree, Safia Minney and I had known about each other though the work in the field long before I started working for People Tree. 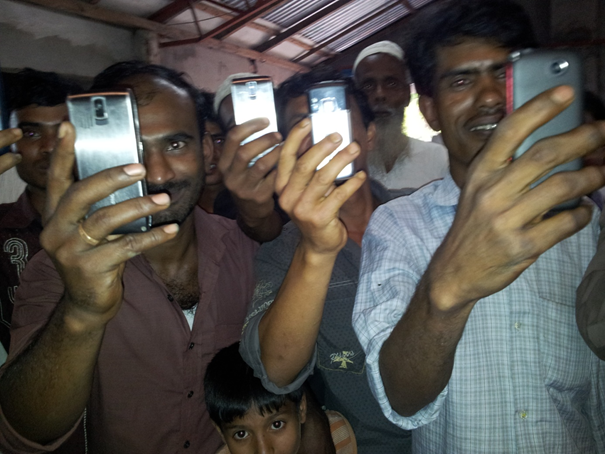 I used to feel a bit intrusive always taking the pictures that are needed to tell the stories behind the products as I visited producers, but now since many people have mobile phones it is payback time. Beautiful Izzy Browton who is the Designer at People Tree was sitting next to me when I took this image so it was not just me that was popular! Why did you join Fashion Revolution Day Board and what do you hope it will do to change the fashion industry? Most industrial workers still worked a 10-hour day yet earned from 20 to 40 percent less than the minimum deemed necessary for a decent life. It was written about workers in America in 1900, but could easily be written about workers making garments today overseas, just because the people who make our clothes are in a different country and no one is looking. Sadly with the Rana Plaza tragedy, there was a moment that the eyes of the world were opened to the situation facing garment workers in Bangladesh. We hope that Fashion Revolution Day will keep consumers asking questions and improving the industry in all sorts of ways. The idea around Fashion Revolution Day is that it brings everyone who wants to do something to change the fashion industry together on one day, the 24th of April, which is the anniversary of the Rana Plaza disaster. Rana Plaza Factory, five months after! 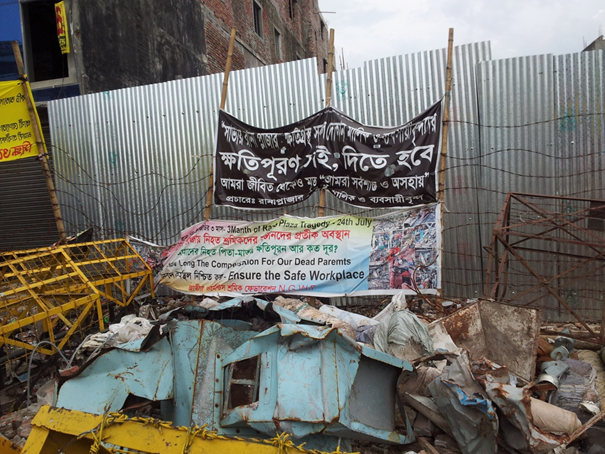 When I was in Bangladesh last week, I visited the Rana Plaza site. It was very moving. The building has mainly gone. There is corrugated iron around the site and banners such as the one below. Such a terrible waste of life. It’s all crazy – before the disaster, I met an American who researching whether we should feed factory workers extra fortified rice as they were undernourished. Ideas like this make me so cross, to pay a worker at below the living wage and then give them rice as charity, we have got to stop thinking about charity and start paying what is due instead. This is why I love Fair Trade. 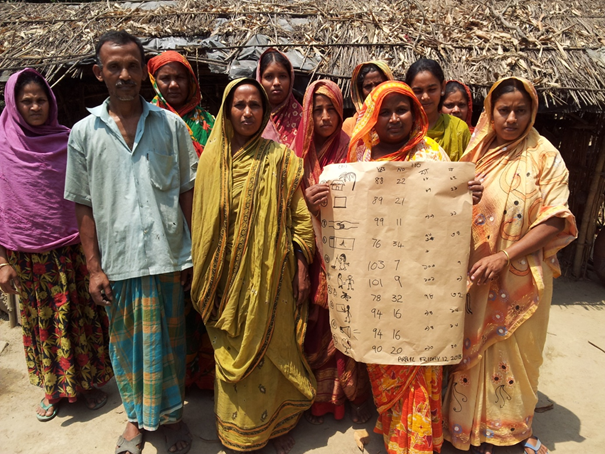 It is a system that ensures producers earn fair wages so they can buy their own rice! Thank you Christine for sharing your passion for Fair Trade fashion on the People Tree blog! What do you think? Join the conversation on Twitter or leave a comment below.